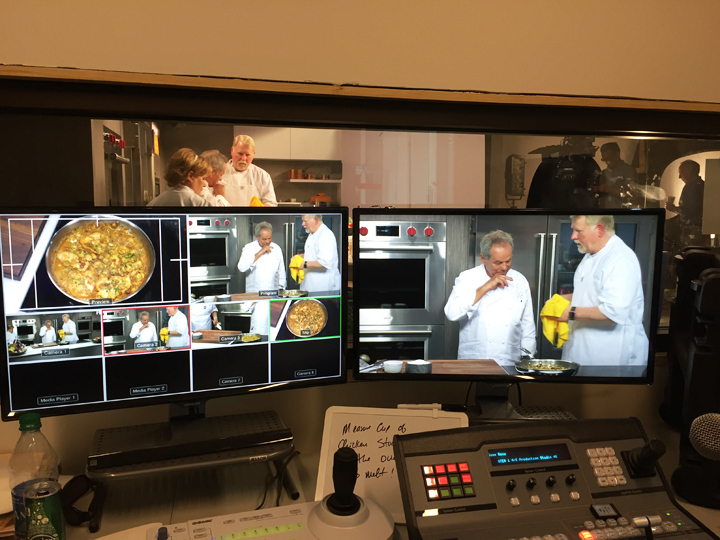 At the beginning of my Road Trip: LA to Seattle (Oct 27-Nov 10, 2015) I spent a delightful afternoon with one of our guest writers at Wolfgang Puck’s new corporate studios watching several classes being filmed for The Wolfgang Puck cooking school. It was very exciting to watch him prepare and watch the filming of the raw footage to create 10-minute classes. In the 3 hours that we were in the control booth we learned about stir-fry beef with snow peas— he uses a lot of Hoisin sauce and chilies and when he says a little bit of salt uses probably a teaspoon or so; we learned about chicken marsala with mushrooms, chicken scaloppini with mushrooms, chicken stir-fry and how to make substitutes for marsala wine; and that when you are frying and want something to brown nicely it’s very important that the oil is hot and that peanut oil can take a higher temperature than olive oil. One of the things I particularly liked was how he gave alternatives (which he does quite frequently) to ingredients and tools that people might not have in their kitchen. For example: raisins in water were substituted for the marsala wine, a saucepan substituting for a wok. One of the keys to his success is not only Wolfgang Puck’s great skill and passion for food and cooking but his very delightful manner. He is friendly, has a good sense of humor and is very accessible in person as well as when you see him on a video. He was gracious when he greeted me and my childhood friend Leta Nadler who accompanied me to the studio. We were able to taste the different recipes he was making and it was fascinating to watch the activity on the set and the editing room where numerous people were monitoring the filming to make sure that they had good footage. The Wolfgang Puck enterprise includes products, restaurants, catering services and now his cooking school. There are restaurants in over 25 cities and they range from casual to elegant dining. The cooking school is available online and offers weekly cooking courses, cooking skills & techniques, easy and delicious recipes, a way to save favorite recipes all for $9.95/ month. What an excellent gift for yourself or someone else. Classes are not intimidating at all, in fact they are fun and I found them stimulating me to create some of my own recipes. The list of good causes he supports includes: Meals on Wheels, Make a Wish Foundation, Race to Erase MS, Children’s Diabetes Foundation and many more. Of course when Leta and I left the studio we had dinner at Chinois, one of the many Wolfgang Puck restaurants in LA. Following the success of Spago, his first flagship restaurant est. 1982, he opened Chinois on Main in Santa Monica in 1983. His early exposure to Southern California’s multicultural population intrigued him and inspired him to fuse the Asian flavors and products of Koreatown, Chinatown, and Thaitown with his French- and California-based cuisine creating a menu of Asian dishes made up with California’s fresh, accessible products combined with French culinary techniques. He is considered to be one of the pioneers of fusion cuisine. The interior of Chinois (as was many of Puck’s restaurants) was designed by his partner Barbara Lazaroff, President of Imaginings Interior Design, Inc who launched a new concept in kitchen design by creating an exhibition kitchen, which we see quite frequently. A native of New York City, Lazaroff’s early studies focused on theater arts, including set design and lighting, all of which we see has infused her designs. So all in all it was quite a full day.